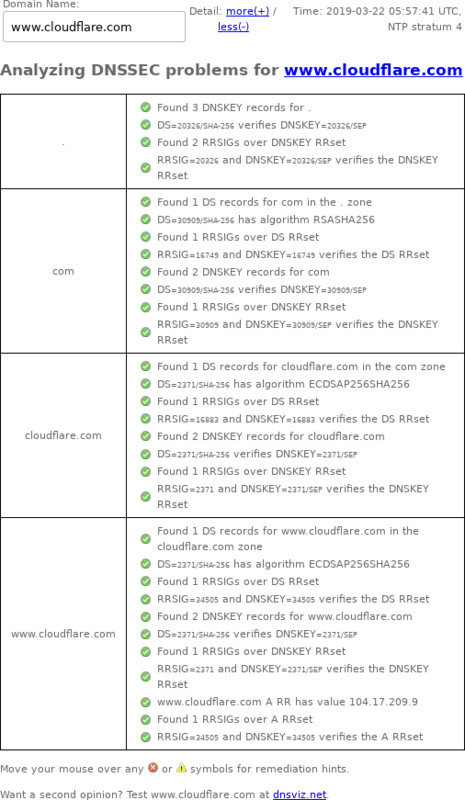 This page gives some details on the www.cloudflare.com DNSSEC outage on March 21, 2019. Cloudflare is one of the largest DNSSEC providers. I saw this DNSSEC outage at DNSViz, Verisign's DNSSEC Debugger, Google Public DNS, and DNS-OARC (both Unbound and BIND! ), in addition to my 3 Unbound instances. This particular outage was caused by a less common type of DNSSEC failure that I've only seen in Cloudflare and TinyDNSSEC. $ dig +short ns www.cloudflare.com. DNSSEC can be disabled in queries via the CD (checking disabled) bit. Let's compare DNS queries with and without DNS SEC. These log entries come from 3 different Unbound instances, all on different computers in different geographical regions.